The Chabad Center of Sudbury invites you to a Lecture & Conversation on Challenges & Conflict Resolution in Israel & the IDF in the 21st Century. The presentation will be co-presented by Lt.Col. Hagay Carmi & hiw wife Michal Carmi and will be shared as a personal perspective & journey. Michal and Hagay met when he was in the middle of officers; course at the beginning of his army service. Together they have seven children. 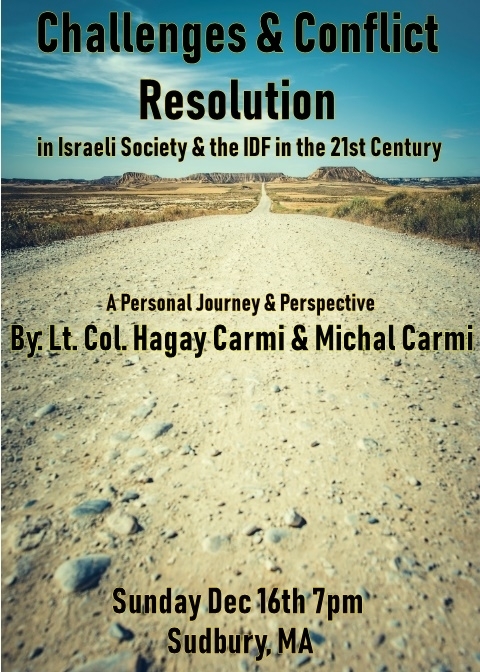 In the past 18 years, they have been navigating between family, Hagay's intensive and meaningful service in the IDF and Michal's activities in the fields of education and writing. During the conversation, Israel's challenges will be presented from a personal and family perspective. Lt. Col. Hagay currently heads a new department in the organization, responsible for addressing unprecedented national security challenges. He joined the IDF in 2000 after completing his BSc in Engineering under the academic reserve program (Atuda) and has served in a variety of leadership positions. Throughout his service, Hagay has contributed significantly to major projects, seven of which won the Israel Defense Prize. Hagay holds an MA in Electro-Optical Engineering from Ben-Gurion University and an MBA from Bar-Ilan University. He volunteers in community initiatives, focusing on immigrant absorption and informal education for school children. Michal has been working for 15 years as a teacher of Hebrew literature in high school in Israel. In the last five years, Michal has been teaching parent groups the amazing "Sheffer Approach" for resolving dynamics between parents and their children. She publishes articles on the "Kippah" website and manages the Facebook page: "Shefer in Love - Michal Carmi". Michal also gives empowerment lectures, inspiring people to achieve goals in life. Her primary role is to raise her seven children alongside Hagay. The presentation will last for about 45 minutes following which the the speakers will do an interactive Q & A session.